Lampwork artist, Mary Ann Helmond's signature designs are her stunning peacock pieces. 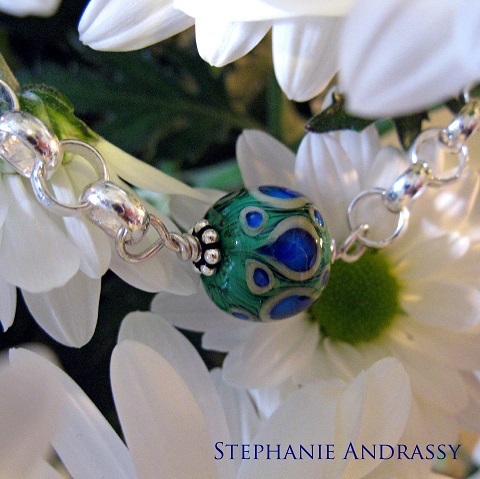 In an delightful turn of events, her peacock lampwork bead bracelet now graces the cover of a new novel! 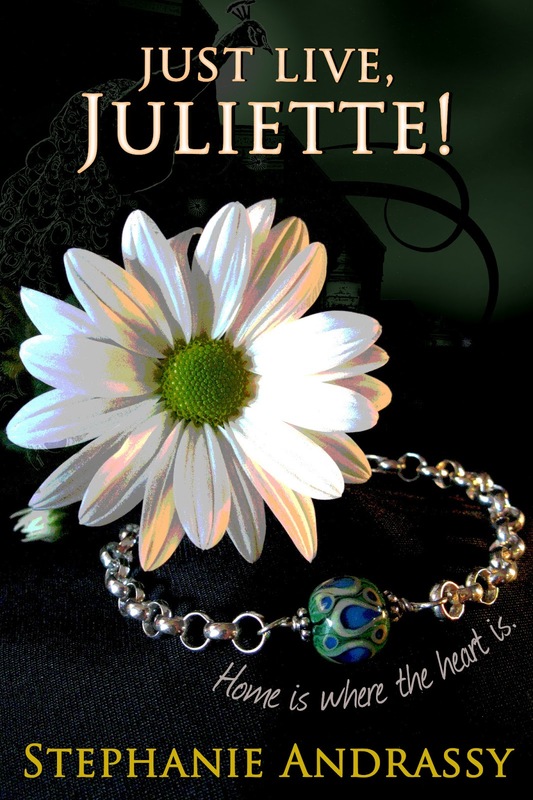 It all started when Canadian writer, Stephanie Andrassy was designing the cover for her new ebook, Just Live, Juliette! (Amazon link for Kindle owners)There was a scene in her story which included a gift of a bracelet. So she planned to have a bracelet on the cover and organize a celebratory giveaway as part of the book's launch. 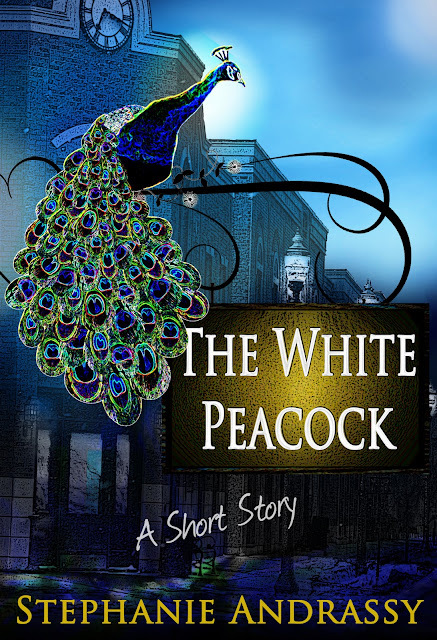 Her free book, The White Peacock, is the first chapter of the longer Just Live, Juliette. So naturally she wanted a peacock inspired "Juliette bracelet" and Stephanie eventually found Mary Ann's designs online. It was a perfect fit and a wonderful way to support a local artisan. Stephanie explained, "I also wanted to make the most of this opportunity and educate readers about the art of lampwork beads, a talent I find absolutely fascinating - and so wrote a very short piece entitled, In the Artist's Studio." It appears at the end of the book. While the cover of the White Peacock is not a jewelry piece, it does remind me of the fabulous collaborative peacock project by Mary Ann Helmond and beader, Roxann Blazetich-Ozols. They both sent me a review copy of Stephanie's book knowing full well I would jump at the chance to write about it! Stephanie's book is a paranormal/fantasy romance. I was so pleased to see jewelry on the cover. Sure beats those awful Fabio covers! She had a chuckle when I told her that and added, "There always seems to be this expectation that hot guys grace the covers of romance novels, and maybe it is just that I don't write "those kinds of romance novels", but I dislike how those covers seem to exclude men in the target audience. I have male readers who thoroughly enjoy my books and I'd like to make it a bit easier for them to admit that they've read it, or share their thoughts on a story in a discussion, without being embarrassed by what is on the cover. ;) I do write from a woman's perspective, and there is romance, but there is always so much more than romance." And she is right! There is indeed so much more than romance. I thoroughly enjoyed reading her book. It was not what I expected. Good imaginative writing with a plot that kept me turning the pages (digitally). The principal characters were vividly portrayed and I can certainly see why readers have asked for sequels as one wonders how things turned out for the other characters. It is a story with an underlying message that we should just live our lives to the fullest. I never thought I would be reviewing a romance novel on my blog but then, I said the same thing about Bollywood movies too. There is always a first time for everything! As a grown man who has read this book, I can confirm that this is much more than "romance". This book is a fantastic trip to an amazing place. It is both a beautiful love story and an amazing fantasy that everyone will enjoy. I have read hundreds of books by well-know authors, and I will say that this is one of the best novels that I have ever read. It is a very unusual book and as the other reader said, it is an amazing place!